You are buying Abbott Hominex 1 Amino Acid-Modified Formula w/Iron 14.1oz Case of 6, model #51116. ADW Diabetes offers a complete line of baby formula both in liquid and powder form. 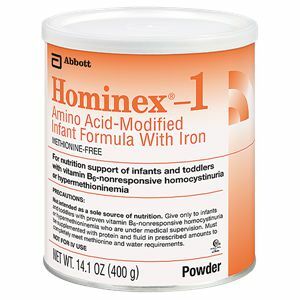 The Abbott Hominex 1 Amino Acid-Modified Formula with Iron 14.1oz Case of 6 infant formula provides Nutrition support of infants and toddlers with vitamin B6-nonresponsive homocystinuria or hypermethioninemia. For use under medical supervision. Methionine-free to allow greater intake of intact protein. L-cystine, in a soluble form, an essential amino acid that is often deficient in diets of infants and toddlers with homocystinuria. L-carnitine (20 mg/100 g) and taurine (40 mg/100 g) to help supply amounts normally found in human milk and foods of animal origin. To meet the nutrient needs of the infant or child, infant formula, breast milk or additional food choices must be given to supply protein and methionine requirements. These may be added to the Hominex-1 mixture or prepared separately as instructed. Depending on the specific needs of each patient, preparation will vary as prescribed by physician. Give only to infants and toddlers with proven vitamin B6-nonresponsive homocystinuria or hypermethioninemia who are under medical supervision. Must be supplemented with protein and fluid in prescribed amounts to completely meet methionine and water requirements. Corn Syrup Solids, High Oleic Safflower Oil, Coconut Oil, Soy Oil. Less than 2% of the Following: L-Leucine, L-Lysine Acetate, Calcium Phosphate, L-Proline, DATEM, L-Glutamine, L-Valine, L-Isoleucine, L-Arginine, Potassium Phosphate, Glycine, L-Alanine, L-Tyrosine, L-Phenylalanine, L-Asparagine, L-Serine, L-Threonine, Sodium Citrate, L-Cystine Dihydrochloride, Potassium Citrate, Magnesium Chloride, L-Histidine, Calcium Carbonate, L-Glutamic Acid, Ascorbic Acid, L-Tryptophan, L-Aspartic Acid, Choline Chloride, Taurine, m-Inositol, Ferrous Sulfate, Zinc Sulfate, Ascorbyl Palmitate, L-Carnitine, dl-Alpha-Tocopheryl Acetate, Niacinamide, Mixed Tocopherols, Calcium Pantothenate, Salt, Cupric Sulfate, Thiamine Chloride Hydrochloride, Manganese Sulfate, Vitamin A Palmitate, Riboflavin, Pyridoxine Hydrochloride, Folic Acid, Beta-Carotene, Potassium Iodide, Biotin, Phylloquinone, Sodium Selenate, Chromium Chloride, Sodium Molybdate, Vitamin D3, and Cyanocobalamin.